The recent death of former Cuban leader Fidel Castro and the restoration of ties between the island nation and the United States has many Cubans and Cuban-Americans pondering the future. One of the question marks in the nation's future is its architectural treasures. 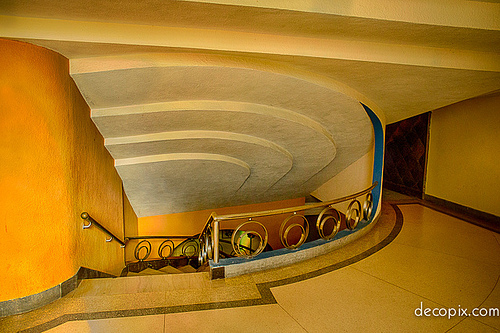 Cuba is home to a real treasure trove of modern architecture. Patrick Symmes of the Smithsonian Magazine recently traveled to the nation to report on "Havana's Hidden Architectural Gems." The challenge of these architectural gems is ongoing maintenance. We begin our tour of Havana's Architectural Gems at the Teatro América. Patrick Symmes stopped by the Teatro América, to watch a dress rehearsal of the musical Victor/Victoria. In the middle of the rehearsal, a piece of plaster fell plummeted down from the ceiling, scattering frightened dancers in every direction. The falling plaster is just one of the many things that artistic director, Jorge Alfaro Samá, has to contend with. Mr. Alfaro Samá airily dismissed the incident as nervously giggling dancers returned to the stage. 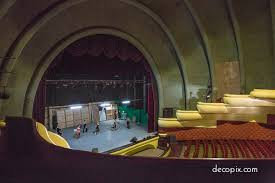 Mr. Symmes writes, "Entire buildings collapse all the time in Havana, so losing a patch of wall or ceiling is routine, even in of the city's most cherished and popular venues...."
Offstage, Messrs Alfaro Samá and Sommes moved to a quieter location to continue their chat. The theater opened in 1941 evokes an ocean liner. 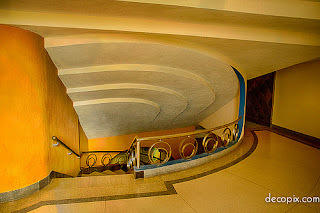 The soaring interior features: a "marble lobby,...twin sweeping sweeping staircases and at balustrades..." The curved lines, floor mural of the zodiac signs, soft corners, sumptuous art deco ornament combine to evoke an elegant cruise ship. I've worked here 18 years, and in that time we learned to work around problems. The company has repeatedly patched ceilings and walls. Patricks Symmes observes, "In more than two decades o reporting in Havana, I've grown accustomed to visual signatures o the city: grimy old buildings, rattletrap cars, little that is new or bright. 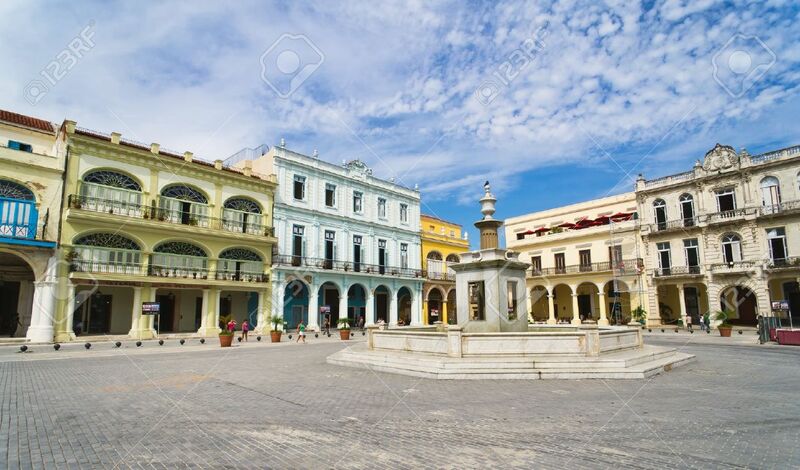 But that is only on the surface; in Cuba, there is always an inside, a life of interior spaces, an this especially true amide the city's hidden gems of architecture." "There is no city in the world so layered with hidden beauty. Yet today, as Havana opens to the world, it is also poised at the edge off collapse." "Can a place long known or its decay become dedicated to preservation? What can be done to protect its architectural legacy? And that be accomplished while also meeting the growing off Cuba's hard-pressed and ambitious people?" First lesson: Watch out for falling chunks of plasters. 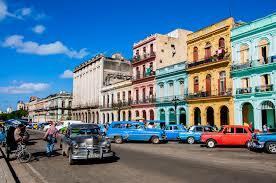 Havana is a fairly easy to navigate, bordered by the sea and separated from its suburbs by a river. Shall we take a quick tour of the city? 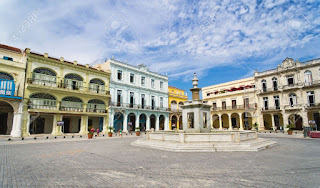 Old Havana was established in 1519 and spreads out the Plaza de Armas, the civic space of the motherland, Spain. From the harbor is its modern equivalent Parque Central district, watched over by the National Capitol building, whose design is based on the Parisian Panthéon. 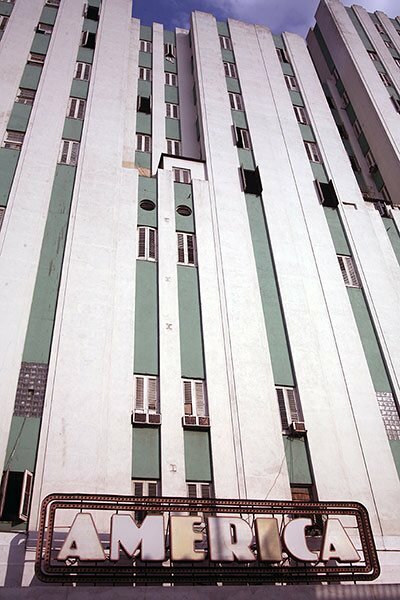 Continuing on our tour, we stop at the elegant faded fin-del-siglo apartment blocks Centro, followed by the Vedado business district, dominated by Welton Becket's 1958 Hilton Hotel, renamed the Hotel Habana Libre. Moving ahead to the modern day Playa suburb and the straight-line Agenda Quinta ("fifth avenue"), decorated with the ornate mansions of old money Cuba. ...Havana is a library of architecture...Every style is well represented there, and the reason for its main is the tripartite culture-African, American, European. From the beginning the city featured a mix of period styles: medieval star-shaped forts, shaded Moorish colonnades, Greco-Roman columns, French landscape design, and the landmark Malecón seawall built with the assistance of the U.S. Army Corps o Engineers. 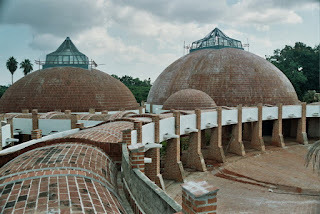 Former Bauhaus architect Walter Gropius paid a visit to Cuba in the forties and the influx of Columbia University trained architect helped make the city an architectural cross roads. The layering continued through 1958, with scant gestures since then, specifically the National Art Schools in Cubanacán. 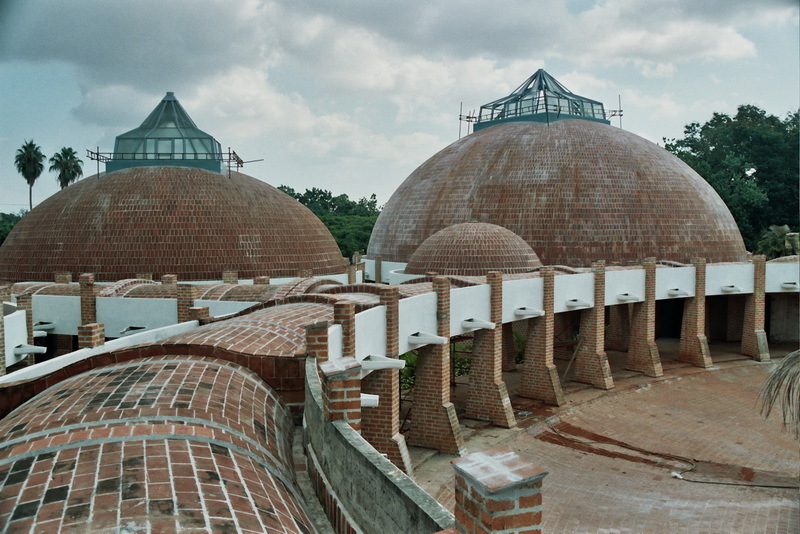 It was in this suburb that a collective of Cuban architect transformed a private golf course into a sprawling campus of rehearsal halls, terra-cotta painting studios, and classrooms. It was a utopian ideal of social progress but by 1965, the dream collapsed, abandoned to the jungle. Now partly reclaimed, it struggles badly, in spite of leaking roofs, but it remains actives. There's a crust that has developed...an age o time over the entire city. The decay. The texture. The colors. The seemingly random organization of building. There's nothing quite like it. Gary Martinez described discovering an old theater with a retractable roof. He assumed, based on its appearance that it was abandoned. However, he and his companions sound men repairing cars in the former lobby. Moving further interior, they came upon a dance group training onstage. Thanks to haphazard repairs, the roof is still retractable-sometimes. Patrick Symmes also experienced that strange surreal feeling-auto repairs in a old theater lobby. The best way to describe it is a dissonance between the outside and the inside. Think watching baseball on a flat screen television inside a richly decorated 19th-century building. 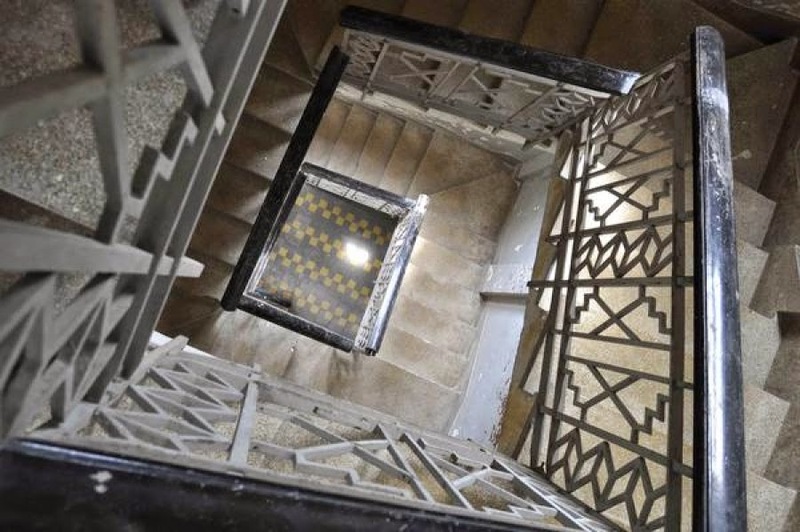 The government said it would get the tiles we need ["to maintain the historic character o building] but it never comes. The family cannot afford to make repairs themselves. She added, A bag of cement costs half a month's salary. Patrick Symmes reports, "Yet the revolution has treated some of its treasures with great care. These include homes confiscated from wealthy exiles in 1959, many of them parceled out as embassies and cultural centers. 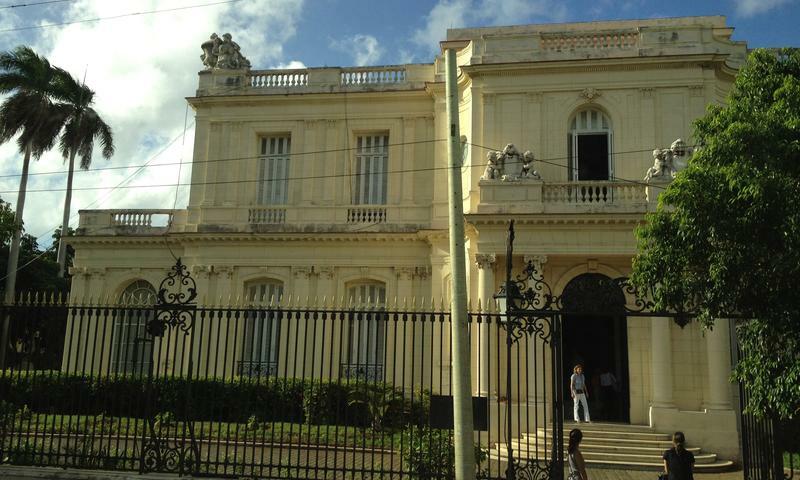 The revolutionary government transferred the contents of those homes-...to official buildings and Cuban embassies, as well as to small museums , including the Museums of Decorative Arts in Havana." The Museum is located in the 1927 home of José Gómez Mena, whose sister María Luisa was a socialite and patron of the arts. Mr. Symmes visited the museum to ask technical director Gustavo López about their shared love of art deco architecture. Mr. López was quick to point out that the American style of art deco is prevalent in Cuba, but not unique; it is found in Florida and New Zealand. 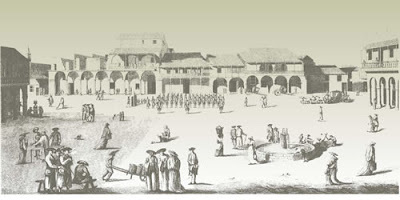 The Colonial architecture is considered the jewel. These jewels are in Old Havana, the protected part of the city. It had good luck to be inside the jurisdiction of the city historian. Mr. López is referring of Eusebio Leal, the well regarded official. Mr. Symmes writes, "Leal was given unprecedented authority in the early 1990s to rebuild the entire district, serving as its de facto mayor and renovation tsar." I remember as a student climbing over mounds of of rubble there,...You had to be careful. Eusebio Leal was tasked with creating special tourism companies, which re-used income for new renovations, in turn resulted in more tourism revenue. It can be a slow process-in one neighborhood, Mr. Symmes observed Cuban workers take over a decade to renovate the Parque Central, the district's main hotel-the improvements are undeniable. Against wind and tide, he's done it...He is a hero even to Cubans who left Cuba. What he has done is going to outlast him and us. Leal's team has more resources; they have their own methods. Without resources or personal interest, some of the beautiful architecture has gone to ruin. 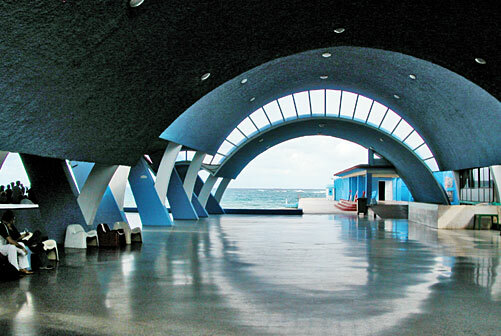 One stunning example is Club Náutico, the prestigious old beach club in the Havana suburbs. The Club is composed as a series of overlapping shells; designed by Max Borges Recio in 1953. The same architect who designed the Tropicana Club. Mr. Symmes reports, "The facility has been corroded by sea spray, huge problem on the waterfront." Other spectacular buildings have been lost to this type of corrosion, included the waterfront amusement park in Miramar called, strange as it sounds, El Coney Island. The carousels and small Ferris wheel that once faced the seaside pavilion have rusty. In 2008 Chinese investors replaces with a concrete amusement park dubbed Coconut Island. There will be a disaster if we don't have norms. 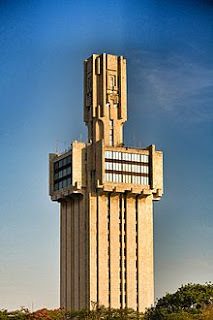 One building that exemplifies the risks is the López Serrano Tower in downtown Havana. 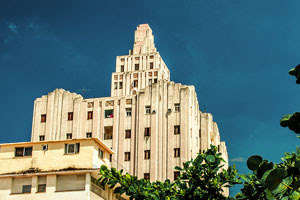 Patrick Symmes writes, "In 1932, the 14-story apartment building was the tallest structure in Havana, an emblem of modernism that evoked Rockefeller Center." 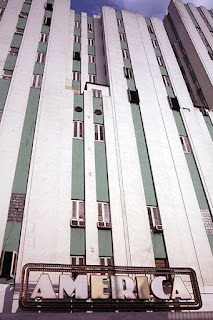 The building still has a great skeletal structures-"...the ziggurats and shafts of the building, by Ricardo Mira and Miguel Rosich-make it a kind of vertical art deco-..." Upon approaching it, Mr. Symmes laments, "...I saw how badly it had aged." The grey concrete is badly stained and the wooden window frames are cracked with random pieces of glass punched out, replaced with cardboard. Air conditioners and make-shift clothes lines clutter the tight spaces overhead; rain seeps through, running down the façade. Ms. Vega made a short film, Deconstruction, about the building's history which was designed to emblematic of Cuba's aspirations toward modern society. 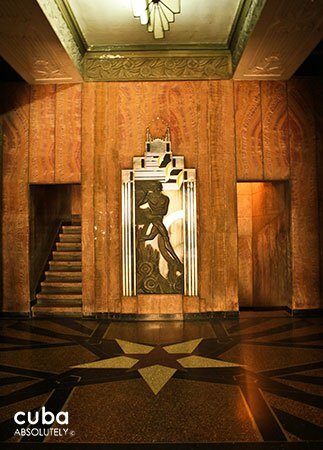 The front doors are bronzed bas reliefs that still shine and visitors move through a marble lobby toward twin elevators, separate by a bas relief by Enrique Garcia Cabrera titles Time. An art deco clock crowned the futurism infused relief before it was stolen. The ceiling light fixtures are wired shut to prevent theft. The López Serrano was intended for Cuba's more affluent citizens, but the rooms were small-the typical customer also owned a country home. Patrick Symmes writes, "The 1932 bylaws even banned children-which was possible because this building was the country's first co-operativbe apartment corporation, emblematic of Cuba's turn toward an urbanized society." 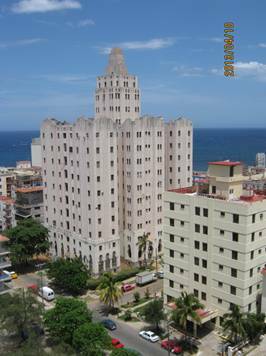 Progressive, it was not-the very same bylaws also banned African-Cubans from purchasing apartments-but López Serrano was associated with one of Cuba's greater hero, the reformer Eddy Chibás, who had offices on the top two floors. In the 1940s, Mr. Chibás rowed against corruption and dictators from an office. He later shot himself while hosting his radio program, the suicide-protest was commemorated by a plaque on the front doors of the buildings. People often don't know where they are living, when it was built, if it was a famous architect...If you don't care for what exists, it disappear. It's not just money...It's lack of knowledge. As with many preservation efforts in Cuba, officials had good intentions but poor execution. Patrick Symmes reports, "Distant bureaucrats with scarce resources oversaw the building, making sporadic and only partly effective repairs-the massive front doors were refurbished, but when new elevators were installed, workers trimmed away marble detailing to make them fit." For decades the government promised to repair the original windows but finally gave up. The residents would have to foot the bill, That costs a lot of money, said Ms. Vega, We can't afford it. Perhaps the biggest threat to the López Serrano is the fact that no one really owns it. The Fidel Castro government nationalized ownership of all apartment buildings in 1959 but ten years ago, it scaled back on this policy and returned ownership of apartment buildings to the residents. Be that as it may, the government still has the responsibility to maintain the shared public spaces and exteriors. That feasible in high-priority places like Old Havana, but for the rest of the city, decay is the rule. Mr. Symmes observed, "Many buildings look substantially worse now than when I first arrived in 1991. An astounding portion of the city's buildings are roofless wrecks. No one is truly in charge." The building's ziggurats indicate a difficult future. If the residents-the more enlightened-are incapable of preserving their building, what about the remainder of the city or, for that matter, Cuba? Strangely, there is some hope in Cuba's weakened economy: "...in a land with little money but plenty of skilled craftsmen, simple forms of preservation are often the best option." Wealthy foreign developers are not allowed to take over whole neighborhoods, yet as Cubans slowly earn income, renovations can take place a little at a time. Part of a building can be converted into a restaurant, a house becomes a hotel, and without a master plan, a block and the historic fabric of a district are maintained. Creeping "Kitsch style" could be held at bay by strengthening Cuba's historic preservation laws, particularly for iconic structures. Architect Gary Martinez prefers the piecemeal approach. 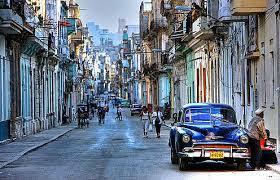 Large swaths of Havana are fallow, buildings are either underused or abandoned. Mr. Martinez said, let people fix them up, slowly, on their own. His business partner Tom Johnson added, that it con almost infinitely accommodate small changes. The restoration of ties between the United States and Cuba foretell of big changes. The Cuban government is soliciting investment in order to rebuild the port of Havana, with much needed housing on one side of the harbor. Patrick Symmes writes, "Just as Eusebio Leal has been able to preserve the residential character of Old Havana as he rebuilt it, others should be empowered to extend that model to other parts of the city. 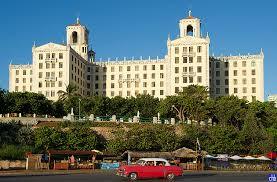 The challenge is to accommodate the next Havana, even while preserving all of the previous one. Would It Help If Museums Were Free?